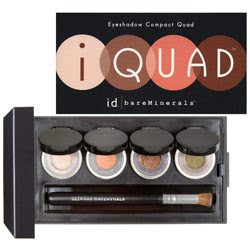 Bare Escentuals has graced us with a new iQuad palette and the Muse couldn’t be happier! 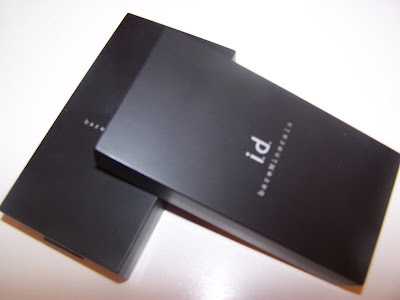 I really enjoy these little compacts and you get some nice product with the quad for $28. Sadly, the newest quad is out of stock, however, I’m positive it’ll pop into stores again soon! Until then I bring you a review of last year’s quads! 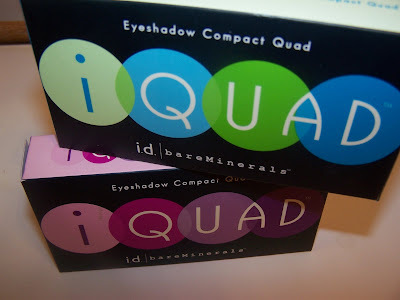 Last year Bare Escentuals released two of these compact quads with the a liner compact quad much to the delight of BE fans everywhere I’m sure (I’ll do a review on the liner quad another time day!). The quads are a heavy plastic so it’s not your typical compact. 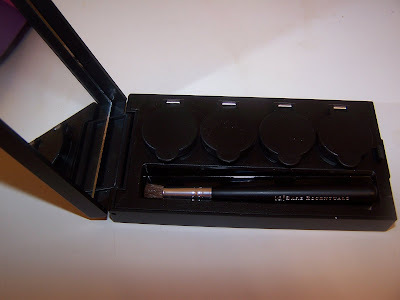 It includes a brush and four loose powder shadows. The shadows each have a lid that you can flip up to use the color. Each time I flip the lid on a color I feel like I’m an artist that’s going to work on a masterpiece canvas! 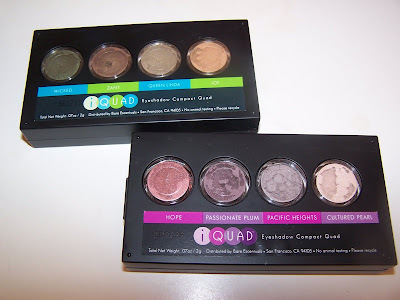 The colors are completely usable in both compacts and match perfectly for one to several different looks. The brush is soft, doesn’t shed, and makes application a snap! It’s rare I use one brush to apply a look but hey when you’re in a rush this little compact is a snap to use and create a genius look! 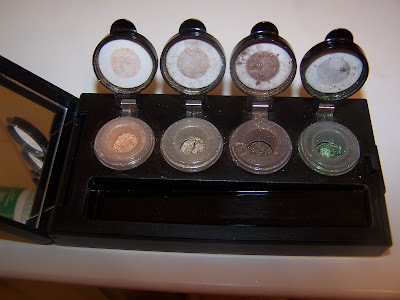 I must say that the compact is very cute and very portable however I do get slightly irritated when I snap one of the lids open I create a bit of a mess when loose powder spills out all over the place. This makes for crummy clean up and waste of product! The good news is with a little work using the compact you get a feel for it so you see less and less of spillage and more and more of snapping the lids opened and closed without suffering from waste! It just takes a bit of practice with the lids to get it just right! These also come with a card that gives you three easy looks to create with step by step instructions on how to achieve the desired look! Quite handy! I’m pretty excited to see this new quad that they introduced! 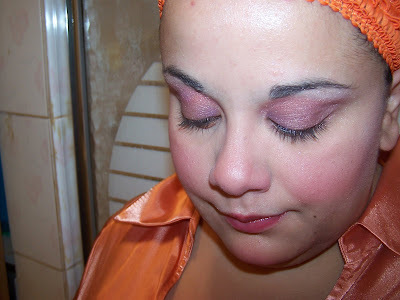 The colors look very Fall and will make an elegant eye look with the browns, golds, and beiges in the compact! 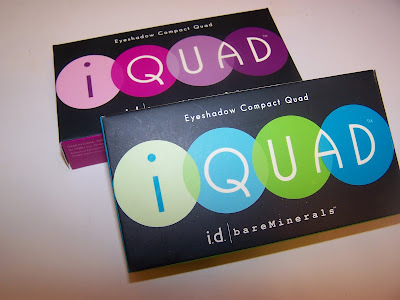 Sadly it doesn’t appear as if the older iQuads are available on Sephora’s site however the new one is and if you’re lemming these older ones after my review you can pick them up from QVC! Overall, I’d say these contain a nice punch of product for the money and they simplify makeup looks which sometimes is a blessing in disguise when we are running late in the morning! The Muse loves her two and she’s definately ordering the third when it pops up in stock again! 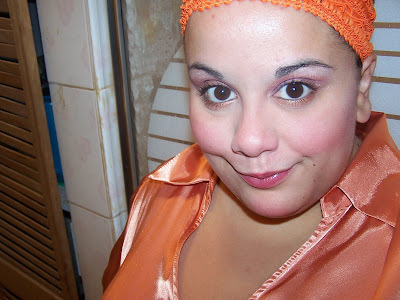 Lilta’s blog is about mineral makeup and is quite interesting! 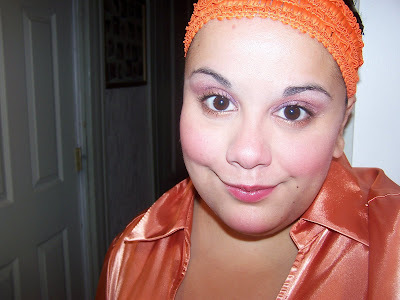 She features and blogs about inexpensive brands of mineral makeup that she likes and has tried (some of which I am now wanting to try). She does a daily entry of her FOTD and what she’s used to create her looks! I was pleasantly surprised that she blogged about me in her daily blog! I’m mostly a MAC girl as Lily says in her blog 🙂 but I’m enjoying her blog so much that I’ve decided I’ll be doing more FOTD’s using minerals! I have so many glimmers, shadows, etc…from BE plus a ton of etailer brand minerals that I don’t use nearly enough! So..Lily..count the muse inspired by your lovely post about my looks and I aim to do more mineral looks in the future! Visit with Lily at Lilta’s MMU Blog. I thought I’d clarify a bit on the Hit and Misses in the MAC Antiquitease Color Story! I think this helps if you’re ordering online or you’re on a budget and just want to keep things to a minimal in what you purchase! I’ve broken all of it down into what was released and what I’d buy and what I’d skip! Of course this varies from person to person since your skin type or coloring may flatter colors better than my own 😉 Plus you just might see something that’s really appealing to you and you want it! So this guide is just what I personally think would be a Hit and a Miss in the color story and may or may not be helpful when making your selections and choices! I love all of it but I think breaking it down to a HIT and MISS makes life easier for sure 😉 Plus if you do have the cash to throw down I’d totally grab a majority of it! Comment and let me know what you think is a HIT or a MISS! Curious minds. Also, a most wonderful reader and friend, Betsy, provided the Muse with a delightful little code for MAC online which is GLOSS. This code gets you free shipping all year long! Thanks to Betsy for that! The Muse hearts you! I was checking my stats a few days ago and I noticed an increase of traffic via a website entitled “Rocketqueen’s Blog”. 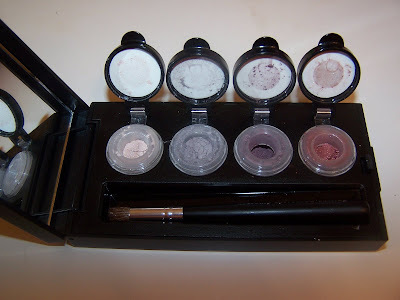 I went over to visit and I was delighted when I seen my review for the Bare Escentuals Smoky “V” Eye Kit was up on the site! I was loving the site but I couldn’t make much out of it as sadly it wasn’t in English! With that said I now bring you good news! Rocketqueen is now in English! Wahoo! The Muse is excited! I’m not only a writer of my own blog but a big reader of blogs and this is quickly making it’s way onto my favorite list! The site consists of a ton of great items that I look for in a blog. Great reviews, FOTD’s, product photos, and all that latest, greatest bits about beauty that I adore reading about! 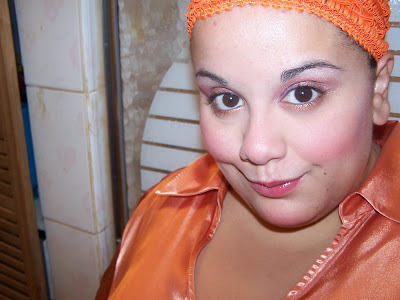 Today Rocketqueen has an interview with Erika from Makeup Bag up on her site which I enjoyed reading! Do have a visit with Rocketqueen! I felt like playing with Antiquitease this morning and I was a bit lazy so instead of thinking up how I’d use the colors I just snatched a face chart from MAC, printed it out, and went to work. Sadly it came out nothing like I had planned and I was probably better off doing my own FOTD rather then using a face chart for the look! 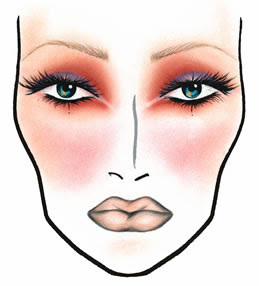 The “Her Fancy” Face Chart is simple enough to follow but the end result is nothing like the photo sadly! The good news is I’m more in love with Mi’ Lady than I was yesterday! It’s such a wicked little color and quite deceiving in the pot! I am a tad disappointed that it’s not the red I was hoping for but I’m still quite properly chuffed that it’s such a lovely shimmering orange/copper color! It reminds me of a subdued firespot (MAC Moonbathe) with beautiful silver sparkle! Sadly, this is a botched up Face of the Day, my apologies but I wanted to share it with you anyway! Got an Antiquitease FOTD you want to share with us? E-mail it to the Muse and she’ll post it up!